For this tutorial we’re going to, again, partially recreate one of the excellent labs available in the Windows Phone 7 Developer Training Kit. All three are added using Add->Existing Item. There are a number of images we’d like to add to the project, and that were created by the folks who built the lab, so let’s grab those and drop them into a folder we’ll create and name Resources. Change the Build Action on these images and the previous two to Content, and change the Copy to Output Directory property to Copy if Newer. Changing the Build Action to Content ensures that the resources will be compiled into the .xap file, making the xap file bigger but avoiding the addition of a dll. 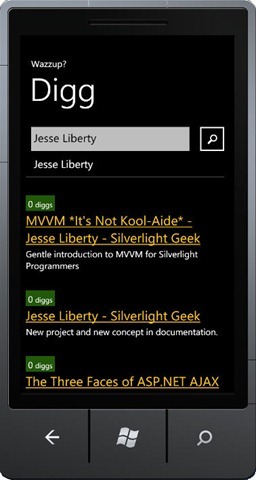 Open Main.xaml and fix up the title for the application and the page. At this point you want to add three buttons and an image. The image is in your Resources folder (assuming you followed the steps above). To do so, create a StackPanel, and use three Button objects and an Image. Before running this we need to make sure that there are in fact the three pages in a Views folder (!) Create the folder and put the three pages in, but for now we won’t add anything to the pages except to set the PageTitle so that we can test that we are navigating correctly. Run the application, click on each of the three buttons and the correct page should appear, but not do a whole lot. Let’s implement the Digg Page’s functionality, specifically with a focus on saving and restoring page state when navigating away from the application (see tutorial on Tombstoning). The Digg page has a TextBox that contains the text to be searched, a search Button, a TextBlock that presents the last searched text, a ListBox that will present the search results. The ListBox’s ItemsSource property will be bound to a collectgion of DiggStory items. We’ll create an ItemTemplate to properly display information from each story. Start by defining three rows and two columns for the content panel, then add the TextBox, Button and TextBlock. The stroke property sets the colo9r of the line, the margin, alignment and height are used for positioning. Finally, we end with the ListBox. The only thing you can bind to is a dependency property, so our DiggPage needs to create a dependency property for the search text. That will be exposed through a standard public property SearchText. We grab the search string and call Search on the DiggService, and we iterate through the search results adding each story in turn. 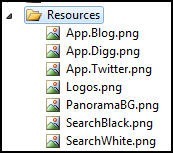 This entry was posted in iPhoneToWP7, Patterns & Skills, WindowsPhone and tagged i2WTutorial, wp7Tutorial. Bookmark the permalink. here at web, however I know I am getting experience daily by reading such pleasant articles. Hello colleagues, how is all, and what you would like to say on the topic of this paragraph, in my view its truly awesome designed for me. Am a new windows programing convert, and am hooked already, i enjoyed completely and immensely your tutorial,please keep up the good work. I really enjoyed this tutorial and how it goes along with the Tombstoning tutorial you have done.